Day twenty-seven of #RPGaDAY2018, and the launch of the final week of #RPGaDAY for this year. It also sees the start of "SHARE" week, and a prompt that is a remix of a question first posed 8th August 2015 which was "Favourite appearance of RPGs in the media". I know this is going to sound odd, but strangely this was a question I remixed myself, taking that question and bringing it up to date with the current trend of Twitch streaming and actual play podcasts, to ask "Share a great stream / actual play". On other days, I've posed questions in a little interview with those who have remixed the questions for #RPGaDAY. It's a bit odd asking myself these questions, but hell... why not? But rather than have you sit through all that, I'll post it at the end of this. My answer to that question? Well, I've only really watched a handful of actual plays - I remember the awesome Titansgrave that Wil Wheaton hosted on Geek and Sundry. The first was Eric's TBD RPG on Geek and Sundry. Hosted by the awesome Eric C Campbell, with an amazing group of players, Eric's TBD RPG was a long running game of Doctor Who: Adventures in Time and Space by Cubicle 7, a game I wrote and designed! Awesome. I was so excited when they announced they were going to be doing this. The stream was massive, and spread the word of the game even further. Brilliant! The Doctor Who stream finished a couple of years ago, to be replaced by Shield of Tomorrow - Eric hosting a new stream of Star Trek Adventures - a game I was (briefly) line developer and writer on! Mind blown! Of course, my mind was blown even further when Eric decided to run a Doctor Who / Shield of Tomorrow cross-over. And I really should mention Critical Role as well. Suddenly D&D is cool again. 1) Would you like to introduce yourself? Who are you and what do you do? I'm David F. Chapman, and use the twitter handle of Autocratik, also the name of my publishing enterprises. By day I work in retail to pay the bills, but by night I'm a game designer and writer. I've written for Buffy the Vampire Slayer, All Flesh Must Be Eaten, Terra Primate, Ghosts of Albion, and Army of Darkness, before becoming Line Developer on Eden Studios' Conspiracy X 2.0 line. I was lead writer and designer of Doctor Who Adventures in Time and Space (now just Doctor Who The Roleplaying Game) published by Cubicle 7, which was everything from the nerve-wracking pitch to the BBC through designing the system to publication. A great and exhilarating experience. Since then, I was briefly line developer and lead writer for Star Trek Adventures for Modiphius Entertainment, and recently completed a hilarious ghost-breaking parody adventure setting for WOIN. 2) How did you first get into tabletop roleplaying? I used to hang around a small group of friends in school, playing video games. I went over to one of their houses one day planning on playing on their ZX Spectrum only to be told - "C'mon, we're going over to JR's and we're going to play something else". I followed, and was exposed to my first game of Traveller. After that, I was hooked. We played two or three nights per week, and most weekends. Ah, the 80s... We were like those kids in Stranger Things only there were more of us, and we drank more tea. 3) What inspired you to take the leap from being a player/GM to what you do now? Ghostbusters. The Ghostbusters RPG from West End Games was my eye opening experience of "Wow, this is fun to read - I bet it was fun to write"... If someone could get paid to write and have fun writing these games, I wanted in. I wrote a couple of adventures for Ghostbusters in the late 80s on a typewriter, photocopied them, and posted them to New York to West End Games. While they were unsuitable and were never used, the feedback from WEG was incredibly encouraging and I tried to keep the dream alive. 4) What makes a game instantly appealing for you? The setting first, then the ease of play. If it's simple to play but does everything I need then I'm sold. If I scratch my head in confusion at the rules, or have to keep flicking from rule to rule, I start losing interest pretty quickly. I just don't have the dedication or patience that I used to have in my youth. 5) What is your favourite game of all time, and why? Really had question. Why did you have to ask that? It'd be a four-way tie between WEG's Ghostbusters RPG - because it's fun, simple and perfectly captures the spirit (pardon the pun) of the movies; WEG's Star Wars RPG - because it was quick, simple, fun, and it was Star Wars just at a time in my life when Star Wars was the be-all-end-all of my universe; Victory Games' James Bond RPG - while it was a little more complex, it perfectly replicated the world of Bond, and the adventures and supplements are a work of genius. 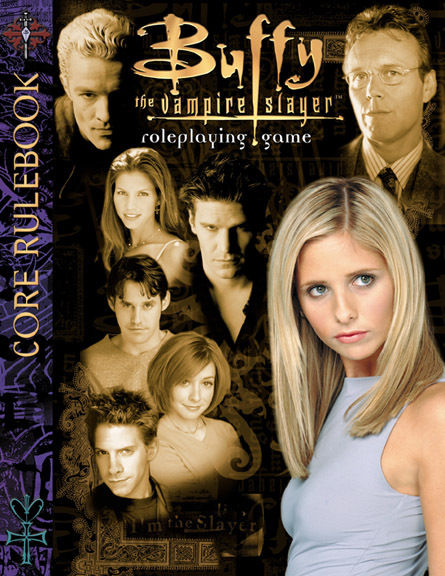 Beautiful game... and finally, Eden Studios' Buffy the Vampire Slayer RPG. CJ Carella managed to capture the wit and pop-culture hip-ness off the series with a game system that emulated the way the series worked. Fantastic. 6) What are you working on at the moment, and where can we find it? Last thing I did was Ghostbreakers - The Spirit of Manhattan for WOIN. It should be getting Kickstarted in the very near future. Imagine a popular (and influential on me) movie series and then I tried to fix all of the issues I had with it, while creating something new and different. It's funny, weird, scary and I got way too carried away working on it. 7) What do you have planned for the future? I've been working on WILD, my RPG of dreamshare, for about seven years now. Every time I think I have a handle on it, something else pops up and works - Imagine Inception, Suckerpunch, Dreamscape, Reverie, Stitchers, Westworld, Twin Peaks, Stranger Things, The Matrix and Sandman all got together in a blender - you'd have WILD. 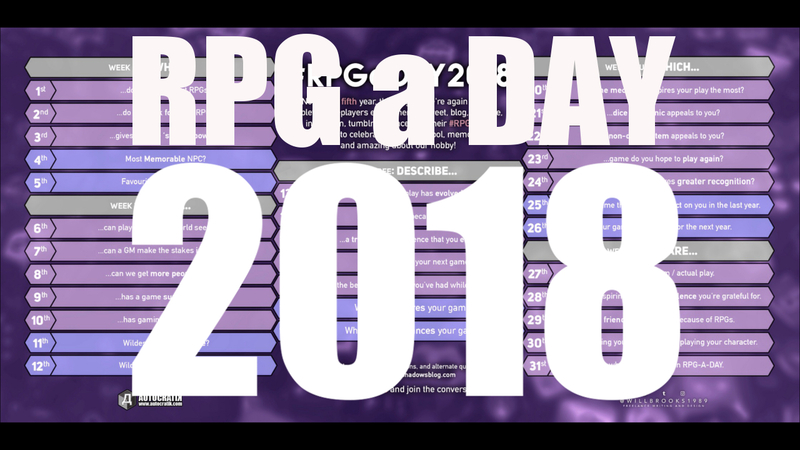 8) Why do you take part in RPGaDAY? I wanted to spread some positivity in the gaming community, just at a time when everything seemed so negative, discriminatory, and vile. Our hobby can bring people together and create amazing friendships. I hope RPGaDAY spreads a little of that.